The final component of the dessert, or dolce, trio at my Italian dinner party two weeks ago was the classic fragole al balsamico, or strawberries with balsamic vinegar. This simple fruit dessert was a refreshing counterpoint to the rich and creamy panna cotta and the crisp and sweet amaretti. 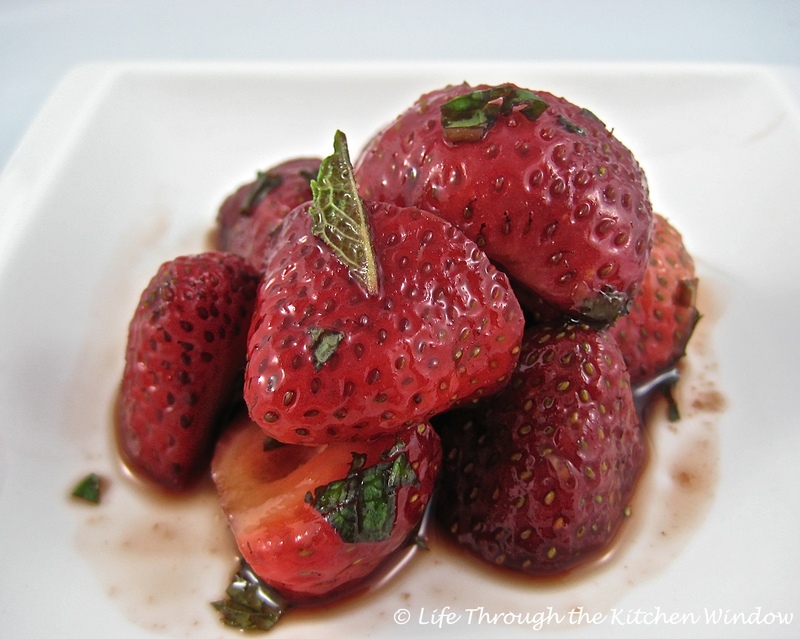 I’ve been intrigued by the idea of strawberries with balsamic vinegar (vinegar?!) for years, but this was the first time I tried it. I was not disappointed. I bought a good-quality, aged balsamic for this dish and its sweet acidity paired beautifully with the strawberries. The recipe I used, yet another from Kathleen Sloan’s Rustic Italian Kitchen, called for chopped mint and lemon zest. Her notes say these are not traditional, but I can attest that they added lovely flavour highlights and aroma to the recipe. Two of our dinner guests were on sugar-free diets, so I left out the sugar, allowing the natural sweetness of the strawberries to come to the forefront. Obviously, my finished dish was more tart than the original recipe (which I’m providing below) but it still worked well. If adding sugar is not an issue, I would suggest starting with just a bit and adjusting as needed, using just enough to enhance the natural sweetness of the strawberries. I can only imagine how good this combination would be using freshly picked local strawberries, and I intend to find out next June! I created a special playlist for our dinner party, and round about the time the dessert course was ending some of the songs included Leonard Cohen’s “So Long, Marianne,” Dr. John’s “Good NIght, Irene,” and Paul Simon’s “Graceland” (as in, “I’m going to …”). A little tongue-in-cheek reminder that all good things, including a delightful evening with friends, draw to a close so we can look forward to experiencing them again. I do hope you’ve enjoyed travelling with me through the courses of this Italian dinner. I hope to invite you on another dinner party tour before too long. Arrivederci! Serves 4 to 6. This recipe is presented as written in Kathleen Sloan’s Rustic Italian Cooking. Since It was one component of a dessert trio I only made a fraction of what the recipe calls for. As mentioned above, I did not add any sugar but do recommend using at least some if you’re using imported berries lacking the full burst of strawberry sweetness..
Slice strawberries into thirds and place in mixing bowl. Add balsamic vinegar, mix well and allow to marinate for about 25 minutes. Add lemon zest, mint and sugar; mix well and serve. Your entire meal must have been delicious. I’m sure your guests left with a big smile on their faces from enjoying your lovely dinner. What an elegant presentation to have these berries in a nice martini glass, with a biscuit on the side. (I confess, I had to look up cantucci. Now I’ll be able to drop that word into casual conversation 😌). Love your mom’s sense of humour! Thank you! 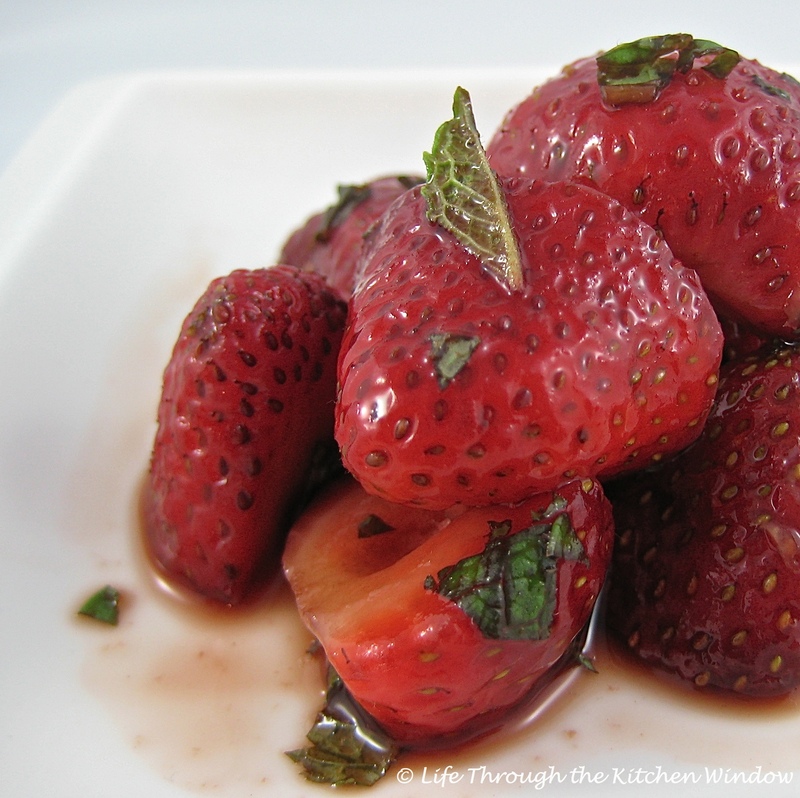 The strawberries with the flecks of green mint and the lovely balsamic sauce does look pretty on a plate, doesn’t it. I’ve made balsamic with watermelon, but I have to say, these cute little strawberries look positively yummy and so pretty!! I’ve enjoyed your dolce trio very much!! Mmm, balsamic with watermelon. Another thing for my miles-long list! (Here I thought I’d be blogging about ‘my’ recipes, but they just keep expanding!) I’m glad to hear you enjoyed my little dessert trio. Must admit though, it was a pleasure tonight to blog about a dish that wasn’t part of that Italian dinner party 😏 – time to move on! Marlene, that Italian dinner was wonderful. Each course brought a new surprise of colour and flavour…loved it!!! That’s a lovely thought, Rebecca … kitchen fun spilling into other areas. It was a lovely evening with friends, and I’m glad you could come along to enjoy it vicariously!